One of the major debates in NT Studies in the past 50 or so years is when and where synagogues, which is to say purpose built religious buildings, began to crop up in Israel or the Diaspora. At one point there were numerous NT scholars who were emphatic that there were no such purpose built buildings during or before the NT era. This in turn led to the insistence that what we see in the Gospels and Acts, which refers to synagogue buildings with some regularity reflects the later conditions of the author, in some cases from late in the first century outside Israel, and then within Israel. In other words, the NT writers were accused of anachronism at best. Here is a good example of how NT scholarship is sometimes done either blithely ignoring the archaeological evidence, or castigating it as ambiguous or irrelevant, or attempting to explain it away. Dr. Lee Levine came forward in writing and in SBL sessions and elsewhere and made emphatically clear that there were indeed purpose built synagogues even in Jesus’ day and thereafter, and that in fact the practice may well pre-date the Herodian era. One of the sites Levine most based his argument on was in the lower Golan Heights, at the village of Gamla, sometimes also called Gamala (from the Hebrew word for camel, because the hill on which the village rests looks like the hump, or perhaps the nose of a camel from a certain angle). As it turns out, Levine was absolutely and positively right. 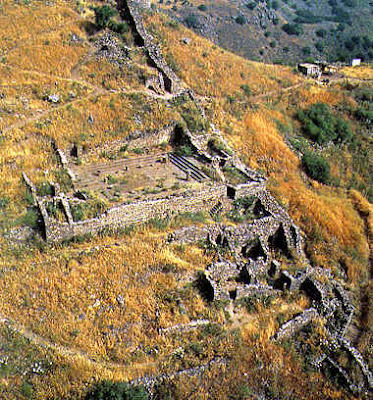 A little of the history of Gamla is in order, since it is not a city mentioned in the Bible. The village seems to have begun as a Selucid outpost in the 2nd century B.C. where a fort was established as a sort of early warning signal for those living in the Holy Land. It seems to have begun to become a civilian settlement of Jews sometime later in that century. Bible readers may know this site if they have read Josephus’ Antiquities, in particular 13.394 which recounts how Josephus himself, as a Jewish commander early in the Jewish war in the A.D. 60s fortified this outpost as one of his main lines of defense of Galilee from Roman attack. According to Josephus, the city was laid seige to by the Romans, and the seige was at first repulsed, but then the Romans, who had built a seige ramp, took the city with huge loss of life (Josephus says as many as 4,000-5,000 Jews died, but he is famous for his exaggerations). One of the questions rightly raised about his grisly account, which even suggests many Jews committed suicide (something forbidden by Jewish Law) is that no human remains have been found (cf. Jews Wars, 4.1-83). In my own analysis of Josephus’ work three cautions are in order: 1) the Antiquities, which is the later work tends to be less historically accurate and more an attempt at apologetics to the Roman audience on behalf of Jews; 2) the Jewish Wars account was written earlier, and is often more substantial and probably more accurate; 3) Josephus in both works is doing his best to make himself look good, and we must always bear in mind that he came under the Imperial patronage of Vespasian and his sons after the war, due to his remarkable prophecy, given whilst Vespasian was still a commander in the Holy Land that Vespasian would become Emperor. Our main interest however in this post is not on the military history of the village, but its religious life, and the excavation of the synagogue at Gamla, which is very substantial indeed, shows that in fact there were indeed synagogue buildings during the NT era, and before. This building can rightly be compared to what has been found at Masada, Sepphoris, Capernaum and elsewhere in the region. Why is this of importance for NT studies? In the first place, the archaeological evidence removes the necessity for the argument that Acts reflects second century Jewish religious life, not first century conditions. My own observation is that time and again when people have questioned the historical accuracy of the remarks in the NT about buildings and historical locales, the NT has eventually been vindicated by the archaeological evidence. This should give pause to scholars who too hastily want to argue alternate cases, merely dismissing the evidence of the NT about things like: 1) where Jesus was buried, or 2) whether there was a synagogue of Greek speaking Jews in Jerusalem in Jesus’ day and the like. achers, nor were they iconoclasts either. They were rather devout early Jews who did not want the House of the Lord, whether synagogue or Temple, polluted by wicked practices. If we turn then to the evidence of Acts 1-6 and ask about the views of the earliest Christians about religious buildings, it seems clear they do not have a problem with them in the least. Peter and other Christians continue to hold meetings in Solomon’s Portico in the Temple, Paul continues to attend worship in synagogues, indeed starting his evangelistic efforts there where ever he goes, and when he returns to Jerusalem, he gladly participates in support of Nazaritic vows and rituals in the temple at the request of James, despite the danger to his own life. Of course it is also true that Jewish Christians met in homes, as did Gentile Christians later. There became an increasingly good reason legally speaking to do so, as the first century marched along and it became increasingly clear that Christians were not simply Jews, or a sect of Judaism. Judaism in the first century was a licit religion. Jews were allowed to have their own temple and sacrifices and they were not required to sacrifice to the Emperor, rather the distinction was made that they could offer prayers and sacrifices on behalf of the Emperor. Even though there was anti-Semitism rife throughout the Empire, the official Roman policy was to allow indigenous groups to continue to practice their religions, as long as it was an ancient, respected, identifiable religion, recognized by the Roman senate. Judaism was such a religion. However, as the first century went along and more and more Gentiles became followers of Jesus, even becoming the majority of such followers in various places in the Empire, it became increasingly clear that the ‘Christianoi’ the partisans of Christ, or those who belonged to Christ (a name first given to them by outsiders in Antioch) were not simply Jews. This in turn made them practitioners of what Romans called a ‘superstitio’, an illicit religion. Now this was a difficult thing for Christians not least because unlike Judaism, early Christianity was a highly evangelistic religion, even recruiting from the highest eschelons of society, something that Luke in Acts draws repeated attention to. But if they were thrust out of the synagogue, and not allowed to meet in the open by pagan officials because of being a ‘superstition’ where would they meet? Of course they would continue to meet in homes. This was not made a religious principle, rather they had to make a virtue out of a necessity. The movement had to continue to grow and expand without constantly being subject to the watchful eye of governing officials who increasingly wanted to promote an alternative new religion— the Emperor cult. Of necessity then, Christians, when the parting of the ways with the synagogue came, met increasingly in homes. The fact that this was not a theological issue or principle but rather a practical one is shown so very clearly already when: 1) Christians began to turn homes into churches in the last third of the first century in places like the house of Peter in Capernaum, and 2) when they began already in the second century to build underground church structures in places like Turkey. At the very top of this post is an image from Turkey of a very early example of this practice. 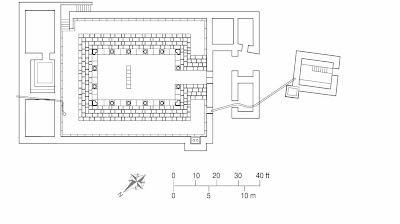 Now what is notable about the underground churches in Turkey built between the late first and 4th centuries, which is to say, between the time when Nero began persecutions of Christians, and when that stopped when Constantine became Emperor and declared Christianity a licit or legal religion, is that clearly this practice was engaged in to protect Christianity and allow it to grow and thrive. The church literally met underground. What is interesting to me about the actual structures of these churches is they have adopted some of the things from the synagogue, for example in their niches in the back of the structure for their holy scrolls, and some things from the home, such as the little tricliniums you find with benches so a meal could be shared including the Lord’s Supper. What I need to stress is that Christians did not build underground homes, they built underground church structures in these places. They continued to live above ground, but they would meet either in well walled houses, or underground during these centuries. They had no problems with building purpose built structures with synagogue features, and increasingly with their own architectural and Christian designs. They did not hold to theological principles that suggested religious edifices were inherently bad, and body life in houses was theologically better. The notion that there was some enormous sea change in attitude about buildings between the time of earliest Jewish Christianity and later when Gentiles were in the majority of Christians is a myth, a myth of pristine origins followed by later pagan corruption. No, in fact there was a continuum from earliest Christianity onward in which Christians were happy to meet in synagogues, temples, or homes, where ever they were welcome and could worship in spirit and truth. 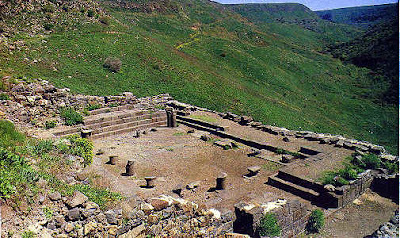 But once Christians had been branded as practitioners of a false superstition by Nero and later Emperors, this increasingly removed them from worship in synagogues, and drove them to adopt and adapt, turning houses into purpose built religious meeting places, and later in areas where it was possible as in Turkey, building often enormous and elaborate underground churches. The earliest Christians neither had an ‘edifice’ complex insisting on religious buildings, nor did they have an anti-edifice complex. They were flexible and practical and went with what was possible in a given place, always bearing in mind that once they had emerged from the Jewish womb and were no longer seen as a part of Judaism, they were an illicit religion and had to be careful where, and how, and when they met. Open, above ground meetings in urban areas became increasingly impossible because they would be noticed. Here below is the famous letter of Pliny to Trajan written in about 111-12 A.D. from Bithynia, asking for advice about what to do with Christians and whether they should be forced to renounce their faith. Christianity was a faith under fire. Here is the text of the most famous of these letters…. It is my constant method to apply myself to you for the resolution of all my doubts; for who can better govern my dilatory way of proceeding or instruct my ignorance? I have never been present at the examination of the Christians [by others], on which account I am unacquainted with what uses to be inquired into, and what, and how far they used to be punished; nor are my doubts small, whether there be not a distinction to be made between the ages [of the accused]? and whether tender youth ought to have the same punishment with strong men? Whether there be not room for pardon upon repentance?” or whether it may not be an advantage to one that had been a Christian, that he has forsaken Christianity? Whether the bare name, without any crimes besides, or the crimes adhering to that name, be to be punished? In the meantime, I have taken this course about those who have been brought before me as Christians. I asked them whether they were Christians or not? If they confessed that they were Christians, I asked them again, and a third time, intermixing threatenings with the questions. If they persevered in their confession, I ordered them to be executed; for I did not doubt but, let their confession be of any sort whatsoever, this positiveness and inflexible obstinacy deserved to be punished. There have been some of this mad sect whom I took notice of in particular as Roman citizens, that they might be sent to that city. After some time, as is usual in such examinations, the crime spread itself and many more cases came before me. or ever had been. They called upon the gods, and supplicated to your image, which I caused to be brought to me for that purpose, with frankincense and wine; they also cursed Christ; none of which things, it is said, can any of those that are ready Christians be compelled to do; so I thought fit to let them go. Others of them that were named in the libel, said they were Christians, but presently denied it again; that indeed they had been Christians, but had ceased to be so, some three years, some many more; and one there was that said he had not been so these twenty years. All these worshipped your image, and the images of our gods; these also cursed Christ. However, they assured me that the main of their fault, or of their mistake was this:-That they were wont, on a stated day, to meet together before it was light, and to sing a hymn to Christ, as to a god, alternately; and to oblige themselves by a sacrament [or oath], not to do anything that was ill: but that they would commit no theft, or pilfering, or adultery; that they would not break their promises, or deny what was deposited with them, when it was required back again; after which it was their custom to depart, and to meet again at a common but innocent meal, which they had left off upon that edict which I published at your command, and wherein I had forbidden any such conventicles. These examinations made me think it necessary to inquire by torments what the truth was; which I did of two servant maids, who were called Deaconesses: but still I discovered no more than that they were addicted to a bad and to an extravagant superstition. Hereupon I have put off any further examinations, and have recourse to you, for the affair seems to be well worth consultation, especially on account of the number of those that are in danger; for there are many of every age, of every rank, and of both sexes, who are now and hereafter likely to be called to account, and to be in danger; for this superstition is spread like a contagion, not only into cities and towns, but into country villages also, which yet there is reason to hope may be stopped and corrected. To be sure, the temples, which were almost forsaken, begin already to be frequented; and the holy solemnities, which were long intermitted, begin to be revived. The sacrifices begin to sell well everywhere, of which very few purchasers had of late appeared; whereby it is easy to suppose how great a multitude of men may be amended, if place for repentance be admitted. You have adopted the right course, my dearest Secundus, in investigating the charges against the Christians who were brought before you. It is not possible to lay down any general rule for all such cases. Do not go out of your way to look for them. If indeed they should be brought before you, and the crime is proved, they must be punished;1 with the restriction, however, that where the party denies he is a Christian, and shall make it evident that he is not, by invoking our gods, let him (notwithstanding any former suspicion) be pardoned upon his repentance. Anonymous informations ought not to be received in any sort of prosecution. It is introducing a very dangerous precedent, and is quite foreign to the spirit of our age. The notes above in brackets are from William Melmoth, a classics scholar of an earlier age. In his recent important Cambridge monograph, James Tunstead Burtchaell, From Synagogue to Church demonstrates beyond a reasonable doubt the indebtedness of early Christians to the synagogue in three ways: 1) in terms of their worship practices; 2) in terms of their leadership structures, particularly in regard to the roles of elders, and 3) in terms of their thinking and adaptation of what religious buildings should look like, and how they should be constructed. Here is not the place to do a lengthy review of this fine study, but the essential point made should be stressed— IT WAS NOT PAGANISM OR EVEN THE INFLUX OF GENTILES INTO THE EARLY CHURCH THAT LED TO ITS HAVING PURPOSE BUILT BUILDINGS, HIERARCHIAL LEADERSHIP STRUCTURES, OR STRUCTURED WORSHIP PRACTICES. NO, THESE THINGS EXISTED FROM THE BEGINNING IN EARLIEST CHRISTIANITY BECAUSE OF ITS DEEP INDEBTEDNESS TO EARLY JUDAISM AND ITS ATTITUDES, THEOLOGY, AND PRACTICE IN REGARD TO SUCH THINGS. It is of course also true, that early Jewish Christians add important things to the mix when it came to leadership and religious structures, worship patterns and the like. Early on it began to have its own religious symbols such as the IXTHUS symbol. But innovation is only what one would expect from a pneumatic or charismatic movement like early Christianity. But since the Gospel was to the Jew first, and also to the Gentile as even the apostle to the Gentiles insisted (cf. Rom. 1.1-4 to his practice in Acts)in every place that Paul went he began by evangelizing Jews, Jews who brought into the church their own religious ethos and practices, including of course their beliefs and praxis in regard to worship, buildings, and leadership. It is always a delicate thing to understand and represent the balance between the continuity in these matters that Judaism and Christianity shared, and the discontinuity. The point is, that early Christian worship, leadership, and attitudes about religious structures was not simply what the Romans would call a NOVUM, something totally new. This is precisely why outsiders, when they attended Christian worship in homes and elsewhere, often remarked on the Jewishness of what they experienced. It was unlike paganism and polytheism in many ways. Read sometime Robert Wilken’s classic book The Christians as the Romans Saw Them and you will see what I mean.